As a teacher offering distance-learning seminars and virtual classroom visits, I rely on a webcam to stream my image to participants, a headset for audio input and output, and several apps. Switching from my MacBook Pro to a Mac Mini connected to an external monitor, as I did some time ago, required me to choose a webcam. After some research, I settled on the Logitech HD Pro C920, which offers HD 1080p at 30 frames per second. More recently, the headset I'd used for several years gave up the ghost, so I decided to replace it with the Logitech H800 wireless headset. I'd bought the webcam; Logitech provided a review unit of the headset. This offers me two audio input options: the excellent dual stereo mics on the webcam, or the mic on the headset. My wife and I share an office, so she's often busy in here while I'm teaching, and we have several talkative cats. I usually opt to use the headset mic; it eliminates ambient noise while allowing me to speak more softly and disturb her a bit less. I've also noticed that, with the camera positioned where Logitech sensibly expects me to put it, on top of my monitor, it shows me just fine. Except that, as I'm generally looking at the faces of my seminar participants on the screen below the camera, I seem always to have my eyes lowered or averted, from the perspective of those on the other end of the conversation. A hard habit to break. So I took a drugstore print of a 2x2" color photo of my wife, pasted it onto a piece of cardboard, then taped this to the flat top of the webcam. Now, when I'm speaking, I talk to her face; its visible presence prompts me to look at the camera. When I broke into distance learning in early 2010, offering online seminars via the VASA Project, I started using a headset I had handy -- a Plantronics wired set with a single earcup that came bundled with the software for MacSpeech. Over time, I found it uncomfortable, due to its unpadded and oddly shaped headband. It also tended to build up a static charge; the audio received from me by my participants got so crackly that I had to unplug it periodically -- every 30 minutes or so -- and let the charge dissipate for a few seconds before plugging it in again. Eventually its wires started fraying, so I saw exposed copper whenever I used it, not exactly reassuring. The 10-port high-speed Sabrent hub lets me plug in everything, while its three power switches allow me to group devices and switch them on only as needed. For example, I have a square USB-powered platform with colling fan, running full-time, on which my Mac Mini sits; that plugs into the always-on cluster of ports. But my USB-powered CanoScan LiDE 25 scanner, which I use only periodically, gets plugged into another cluster reserved for devices that I turn on only when necessary. And while I don't have urgent need for this hub's lone fast-charge USB port, since I now have the 10-port charger, it would certainly prove useful to someone who didn't have a dedicated multi-port charger. The headset's charge more than sufficed for that 150-minute unbroken dialogue. They claim a 6-hour charge, though I can't imagine a teaching session of that duration -- more important for office workers, I suspect. But it's there if I need it; and, if I have to go even longer, I can charge this while in use, via the 6-foot USB to micro USB cable Logitech thoughtfully provided with this unit. As usual, I sat at my desk for these online sessions -- no wandering around. But if I did need to move, in order the demonstrate something or write on a whiteboard (or even go upstairs to our kitchen for a cup of coffee), this headset has a 40 ft. wireless range. It also folds, rather like a particularly bulks set of sunglasses, making it convenient for travel purposes. If I do take it on a trip, I'll find some kind of case or bag to hold it; Logitech doesn't provide one. Last spring, before I got the Logitech headset, I used my previous headset plus the Logitech webcam, with its crisp widescreen view, to record several dialogues with participants in an installation project in which I'm collaborating with a Canadian artist. We ran these also in Google+ Hangouts, posting the results to YouTube; the results were satisfactory, especially so on the video end. But I'm sure the new headset will significantly improve on that, in terms of audio quality. Distance learning (indeed, online dialogue of all kinds) works best, in my experience, when the technological components, hardware and software alike, function so dependably and unobtrusively that, at both ends of the connection, they get taken for granted. That facilitates establishing the sense of personal connectedness. By that standard, the combination of the Logitech headset and the Logitech webcam make a perfect combination for the online teacher. Finally, as an afterthought, I decided to test the Logitech headset with Apple's built-in Dictation app. Some years back I'd tried another speech-to-text app, MacSpeech, but didn't really take to it. Lately, though, I've found myself using Dictation. Not often to generate new prose -- I still think through my fingers on the keyboard -- but as an alternative to the tedious chore of keying in existing texts by myself and others, texts that I have in printed, typewritten, or handwritten form but don't want to scan and OCR in to a new file. So I prefer to read them in. The Logitech headset works fine for that purpose, eliminating any ambient noise that might interfere with Dictation's reception of my spoken words. I saw a dramatic drop in errors as soon as I combined Dictation with the headset. I recommend it for that purpose also. MSRP info: Logitech HD Pro C920 Webcam, $99.99. Logitech Wireless Headset H800, $99.99. 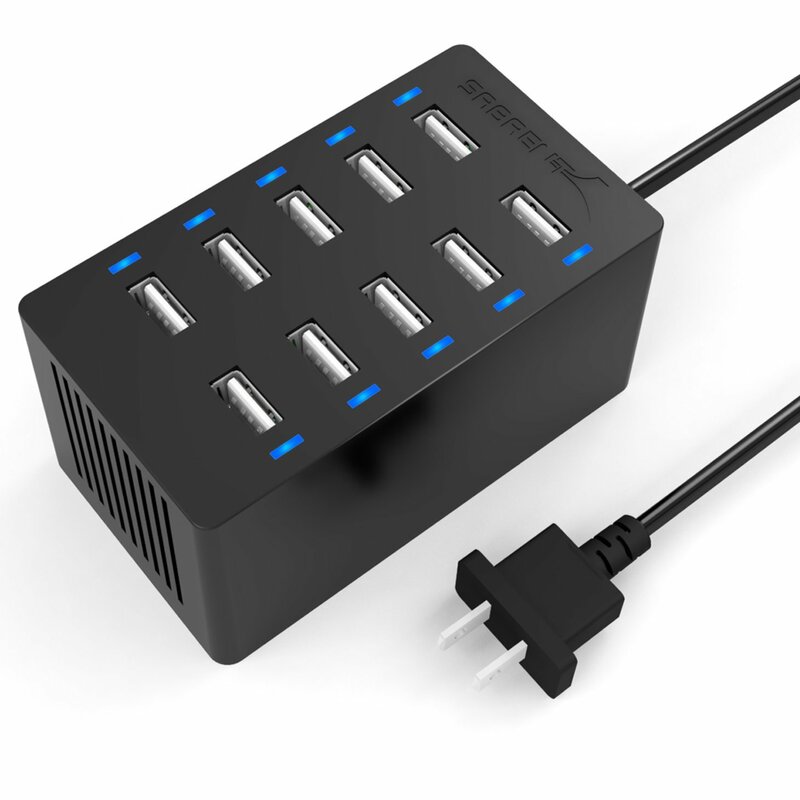 Sabrent High Speed 10 Port USB 3.0 HUB, $89.99. Sabrent 4-Port Portable USB 3.0 Hub with Power Switch, $36.99. Sabrent 60-Watt 10-Port USB Charger, $44.99. (Sabrent sells its products through Amazon, at steep discounts -- 50 percent or so.) iGlasses, $19.99 (free lifetime updates). Webcam Settings, $7.99.